Keeping track of requests, communicating changes and tracking allowances can be tricky. Let us handle the heavy lifting, so you can focus on keeping your staff happy. 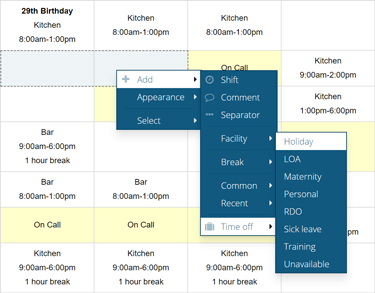 Time off is displayed directly on the rota, so you'll always know who's available and who's not when you're allocating shifts. Similarly, when adding or approving time off, we'll let you know if the staff member has any shifts already scheduled in that period. Are your staff objecting to time off requests from their colleagues? Perhaps two employees have requested the same days off and you need to decide who stays and who goes. 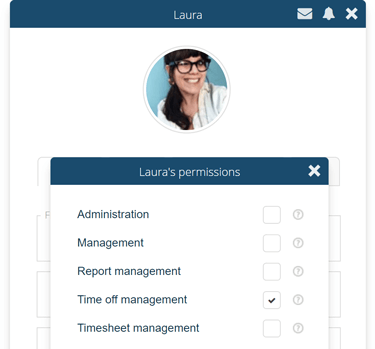 Findmyshift allows you to keep time off requests/approvals private, helping you to avoid staff conflict. Being in charge of the rota doesn't always mean you're responsible for responding to time off requests from your staff. Findmyshift let's you delegate time off responsibilities to other members of your team, freeing up your time to focus on your business. Whether it's a new holiday request, a date change or a cancellation, we'll make sure everyone who needs to know gets notified. Findmyshift sends notifications as emails, text messages and push notifications. Whether you're managing maternity leave, paternity leave or just a regular holidays, keep on top of things with time off categories to match the requests you're receiving. Set staff members as unavailable on a recurring schedule, whether it's daily, weekly, monthly or yearly. Mark them off automatically to avoid any conflicts.